In the opening page we are introduced to the main character Max, an intelligent asteroid hunter who tries to make enough money to pay off her space ship, but who loses it in the circumstances following her discovery of the alien probe. This might not be bad luck, as it results in her being hired as a scientist on Mars, working with a scientist team that studies the probe, and also getting back with Tina, a former lover and an ambitious journalist, who now works on Mars. We learn, as the story slowly builds, that there have been findings of alien artefacts both on Mars and Moon, findings that are kept in secret by the SolGov, military and Earth leadership. When it’s discovered that the probe comes from a large alien colony ship that is heading for Mars, the military sets out to stop the aliens, with a shoot first, ask questions later attitude, dragging the scientist team along on the journey. The approach to the aliens as dangerous enemy who must be stopped, results in political and religious debates and conflicts on Earth and on Mars. The story is told from the perspectives of several characters, which is both a strength and a weakness of the book. Through the eyes of Max and Tina, different members of the scientist team, a military commander named John and one of the new colonists on Mars, a Baptist preacher named Gareth, we are introduced to the different aspects and dilemmas of the plot. We are also given glimpses of the characters’ backgrounds and fragments of the history of this futuristic world, like what climate change on Earth meant for the surviving people, wars that took place, orphans who grew up in camps, etc. Murrain is generous with details, some really nicely done—like a scene where the characters talk about where they were and were doing when they discovered the supernova fifty years earlier. It is a complex world Murrain is building in this book and I think that doing this through the many voices makes this complexity more personal and more understandable. I like this touch; telling the large story through the little man’s perspective. This is however also a main weakness of this book, in my opinion. I understand that Murrain wants to introduce us to many characters in this book, since it’s the first of several books. She probably wants to lay the ground for the stories to come. I feel however that there are too many characters to get personally acquainted with in this relatively short story. Too little room is given to each of the characters and it sometimes feels a bit superficial. Together with all the details in parts of the book, it gets difficult to follow the plot. I wonder if the story would have gained more flow in the narrative and more psychological depth with fewer main voices that were given more space in the story. That said, I like that Murrain goes outside the standard frames of the science fiction space opera story and gives us a strong, rebellious, lesbian woman protagonist and characters of all religions, races, gender, nations and sexualities. This diversity is refreshing. At the same time I think she is a bit stereotypical in how she for instance presents the military. I think what will stay with me from this book are not the characters, but the way the book impressed me in general with its insight in politics, religion and power structures. It’s convincing how Murrain describes the tense relationship between the new worlds in the colonies and the old world on Earth, the culture clashes, and the different religious reactions to the aliens. I’m also impressed by the science and technology that permeates the story; descriptions of new technology are spread throughout the novel, like the little scene when Tina notices that the Mars Governor, in contrast to most administrative types who used their A.I.s as their primary interface, uses a keyboard. In general, except for the multitude of voices, I liked this book, but it’s not completely without some other minor flaws. It should have been proofread an extra round (is the name of the chronicles “Cassiopeia”, “Casseopeia” or “Cassiopeisa”?). I also feel that parts of the story are told to us more than we are allowed to get acquainted with it on our own and see it with our own eyes. Like how the characters analyze different situations. John wonders if the captain and the admiral have a more cozy relationship than John knew because the captain interrupts the admiral. Max wonders if Lodan and Michael have something going on because Lodan gives Michael a dirty look and Michael just smiles in response. In my opinion, this irritates a reader who’d like to figure out this on her/his own. Nevertheless, these are minor criticisms of an otherwise nice and intelligent story. 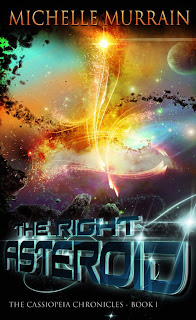 All in all, I feel that The Right Asteroid is an entertaining book, worth reading if you either like space opera and space exploration, or like stories with strong female protagonists and characters who go outside the standard box of science fiction.